You are here: Home / Business Models / You Should Scale Your Tech Company Sales Force When….. Many people would finish the above sentence with something like “when you ship your first product”, “when you start your company” or “as soon as possible”. All have a similar meaning–everyone needs sales revenue and would like as many salespeople as possible to drive revenue growth. It seems logical that these are all appropriate responses–but in my experience it’s not always the case. First of all, I’m using the term “scale your tech company sales force” in a very flexible way. I really mean taking it up to the next level, whatever that may be at the present time. That means different things to different companies, who have different sales business models and are at various stages of development. For example, in a ground floor start up “scaling the sales force” might mean hiring your first dedicated, professional sales rep! In early startup circumstances, early sales activities are often performed by company founders or senior executives (and rightly so). At a more intermediate level of development this might mean going from 1-3 in-house reps to hiring an outside field sales force covering your home country and organized by region. At the highest level of development, scaling the sales force could mean hiring a large number of sales employees in every developed region of the world (regions outside of the home market are often handled early on in a company’s sales organizational development by resellers, distributors or other partners). While these events are very different in a lot of ways, they all represent major points of inflection in the composition of your sales organization and potentially your sales process as well. The important things these three “step up” examples all have in common is that they cost a LOT of money and usually bring quite a bit of change in the way your company does business. This is the technology business–you’re not selling peas or perfume. There is considerable risk that any new software or hardware product may be very buggy in the period immediately after it ships. This is always a tenuous time, when caution should be exercised with respect to not getting too far ahead of the situation by implementing too quickly next steps of any kind. In addition to sheer buginess, sometimes products just disappoint in the marketplace for a number of reasons: The price may be too high, you’ve not picked the proper distribution channels, product planning wasn’t perfect – leading to key features that the market requires but are missing in this version, etc. In these cases, massive hiring of new sales reps would be very ill-timed and possibly even counterproductive, so it makes sense to hold your powder until the product is ready to make real headway in the marketplace — which is when you’ll be able to maximize your sales force ROI. Another common product-related issue is when the product is stable and able to meet the needs of the market, but due to the early stage of the product category/technology it requires an extreme amount of technical hand-holding. In this particular situation it may still make sense to scale the sales force, but it may require quite a bit more in technical support, field support engineers than you might have counted on. If the new sales reps cannot sell the product somewhat independently, the ROI of scaling the sales force is greatly reduced when compared to products that they can handle themselves with a reasonable amount of training and modest levels of tech support. In these circumstances you may be better served deferring massive sales force expansion, to conserve most of your capital until the product is more mature and can be sold in a more traditional, sales-driven fashion. A more modest mix of a few additional sales folks along with beefed-up technical support resources may be in order in the interim. This is a common occurrence that I find with companies that are very anxious to grow. They are able to make those very difficult initial sales, either completely filling out a good list of reference customers, or maybe even going well beyond that. Possibly they’ve even made some very impressive sales to blue chip customers, whose names will carry great weight as they attempt to sell to the rest of the broader market segment. But in many cases those sales have been made with a great deal of hand-holding (sometimes by scarce senior resources), customization, massive discounting and the like. Of course, to get those early critical sales anything and everything necessary SHOULD be done. But at this point it’s not unusual that every deal has been difficult, unique and has required resources or policies that just can’t be duplicated in a wider sales campaign. What really sells the product? No one knows, because every deal has been different and often required unusual efforts to close. In essence, there is no repeatable sales process that the new sales force can be successfully trained to use. This is a prescription for failure when you scale up your sales effort. I find it to be a common reason that companies with initial promise often fail to reach the potential that their management feels is achievable. Any expansion of sales activities, whether by an internal employee sales force or external sales channel, must be grounded in a well-understood sales process that can taught to and repeated by the sale resources you are tasking to bring in the orders. I’ve also seen this issue kill or cause great retrenchment in a number of tech companies. What happens is that the product appears ready and the company believes there is a repeatable sales process in place. The decision is then taken to go full speed ahead on hiring initial sales reps or if the company more mature, scaling the sales force further. But the gotcha is that there really isn’t a capital base in the company to handle the additional burn rate this creates, which can be very substantial when adding significant numbers sales people for the long haul. The assumption is made that the product is great, so sales will “take off” and the new sales force will “pay for itself” in no time. Sadly, in most cases this is wildly optimistic. There is a learning curve under the best of circumstances and in the tech industry in particular too many things can go wrong, as discussed in other parts of this article. It is usually imprudent to expect new sales people to begin paying for themselves within the first 6-12 months. If they do, great! But you need to have the financial wherewithal to stay the course if things don’t immediately go as hoped. Sales people should be seen as a long term capital investment, not viewed like a short term or one-time investment like a marketing campaign. So before you make that huge investment in increasing your sales force, make sure that you have the financial staying power to absorb an early negative cost impact before your ROI kicks in. Above I alluded to a few key issues that can torpedo the effectiveness of a greatly expanded software or hardware sales force. On a broader scale, with a greatly expanded sales force often comes a large uptick in the demands upon other parts of the company, which I’ll refer to generally as the “company infrastructure”. Do you have an HR department that can properly recruit, on-board, train and service the needs of the new sales recruits? Is there adequate office space and technology to house them and enable them to work effectively? Is the marketing department staffed adequately and does it have sufficient budget to create the lead flow to keep the expanded sales force busy, or will they be forced to spend time more inefficiently doing a lot of cold-calling (which I often refer to as “door-to-door marketing”). Maybe most importantly in the tech business, are there adequate technical resources available in the form of sales engineers, demo units and liaisons to the development team so that deals aren’t held up waiting for technical support? These questions may seem obvious on the surface, but I see many companies that are “in a hurry” skip one or more of these steps and go right to massive sale hiring–figuring it out as they go along. Sometimes it works out fine – but often it ends in catastrophe. So if the points above detail when you should be cautious about expanding your sales force, then when should you scale up your sales team? I’ll finally flip the discussion back around and tell you how I would finish the sentence contained in this article’s title: You Should Scale Your Tech Company Sales Force… only after you’ve made sure your entire company is ready. 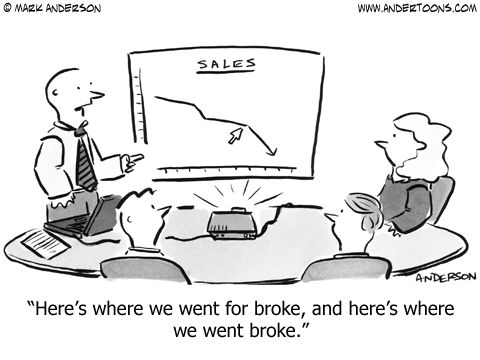 Expanding the sales team prematurely can be very costly and disruptive. Under bad circumstances it can really put a hitch in your growth plans — and in extreme, overzealous cases I’ve even seen it kill a few companies along the way. So above is my list of items that I believe should slow down the scaling of your sales force. Is your list similar? Am I off base? I’d love to hear your point of view. Post a comment to add to the list above or take exception to the whole concept.